Sweets are a wonderful thing, bringing peace, love and unity wherever they are enjoyed. OK, maybe not always (we can all remember fighting with an older sibling over the fair distribution of treats or who’s had the most blackcurrant fruit gums), but broadly speaking, sweets spread a little love and bring back yummy memories of happy childhood days. The smell of Anglo Bubbly, the crackle of Space Dust, the soft texture of Shrimps, the fizz of sherbet and taste of Vimto. All these and more take you right back to the corner shop where 10p seemed to buy you the world. 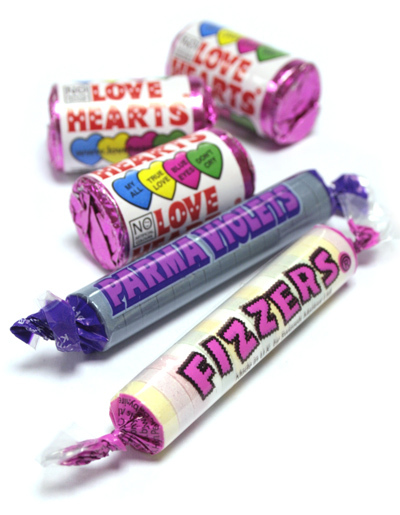 The good news is that many of our retro favourites are still going strong for a whole new generation of sweet lovers. Most have been revamped with fancy pants new packaging (like Sherbet Fountains, no longer in a cardboard tube but recyclable plastic with a cap to keep the liquorice fresh! ), some have got smaller (have Wham Bars shrunk or are we just bigger? ), some have got bigger (Fruit Salads and Black Jacks are chunkier these days) but they still taste just as you remember. In fact we welcome the changes because if it means they’re still around to aid a spot of nostalgic creaming occasionally, that’s fine by us!